The Harlequin Hotel are privileged to be able to offer our customers the facility of the onsite Royal Theatre & Events Centre Castlebar. The venue is a state-of-the-art Theatre complex offering a 2,010 person fully-seated capacity. 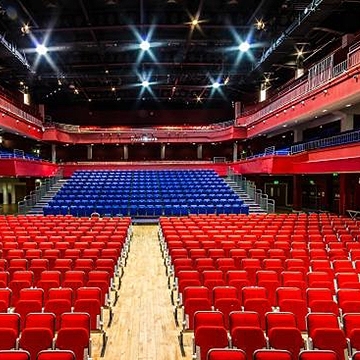 Adjacent and accessible through a linked glass corridor to the Harlequin Hotel, this facility provides the largest theatre venue in the West of Ireland second only to the 02 venue in Dublin. Hosting a wide and varied collection of National and International acts on a regular basis we are sure to have a performance to suit all tastes. The property boasts good road and rail links from Galway, Sligo and Dublin, making it easily accessible from anywhere within Ireland. We are also situated just forty minutes drive from Ireland West Airport Knock with flights direct to England, Scotland, Portugal and Germany, making us the ideal venue for those travelling from Dance Schools further afield. Shannon & Dublin Airports are a 2.5 hour drive from the Castlebar.